Edsel Grizzler Book 1 had me glued to the page. I couldn’t wait to see how my many questions were resolved in Book 2, but there’s always a problem with intriguing reads like this. Your questions may be answered, but they draw you deeper into the mystery and expose more unanswered questions. In Book 1, Edsel returned from Verdana, the land of lost things because of Jacq’s sacrifice. Now Edsel is on a mission to rescue Jacq. When he finds her, he provides updates on all that has happened in her absence. This switching between worlds through conversation and flashback works well. James Roy creates three dimensional worlds. I watched the steam rise as the retreating train left Widen and could almost breathe the despair in a sadly changed Verdana. 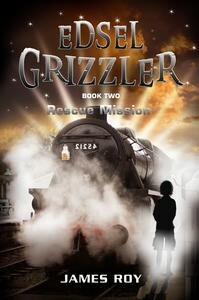 If you enjoyed Edsel Grizzler Book 1, you’ll be waiting for Book 2 like I was and you won’t be disappointed. On the scale of light to dark, Edsel’s tales are more dark than light. There’s not a lot to make you smile, but plenty of intrigue instead. Lives are at stake. Does Jacq hold the key to set things right – again? Who would have guessed that Ben would turn out the way he has? Is there any other way to save the children? You guessed it. Some questions won’t be answered until Book 3.